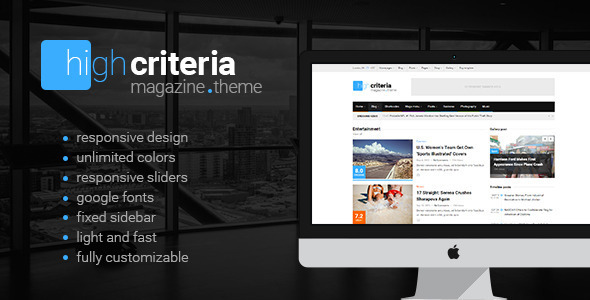 HighCriteria is clean, elegant and modern design Multipurpose Magazine WordPress Theme with focus on content. This theme is totally responsive so it adapts to any device. It is loaded with great features like HTML5 and CSS3 effects. You can make unlimited unique homepage layouts in minutes with easy to use admin panel, compatible with WooCommerce shop plugin and built-in review system. It has a separate gallery system so you can easily filter galleries by category. Its Bannery system makes it easy to add images, text, videos or any other type of HTML code. Item Reviewed: Modern Design Multipurpose Magazine Theme 9 out of 10 based on 10 ratings. 9 user reviews.